Migration inside the US is not anything unbelievable. Every year, local state organizations provide reports on the migration statistics, and it says that most of the people relocate towards the south and west moving to Utah, in particular. It is one of the western fast-growing states that welcomes people from different parts of the US. The population of this state has been growing steadily since its foundation and only for the last 8 years, it has increased by over 9%. According to the state statistics, Utah has the 4th highest population growth rate and by 2020, its population will go far beyond 3 million people. If the following rapid growth of population will continue in such a tempo, by 2060, the state population will exceed 6.8 million people according to experts. This increase is caused by hundreds of people moving to Utah for a permanent residence as well as high birth rates. The statistics of 2016 states that the population growth in the state because of inbound migration was 0.8%, while the general increase was by 2% in total. Many people consider only benefits of the state when they decide to relocate in it, but there are also things to know before moving to Utah and making a final decision. It is natural that there are some advantageous features that attract people in Utah and make them leave their home state in search of a better life. Let’s find out what encourages Americans to settle in Utah. The main positive feature of Utah state is a lower cost of living. It is one of the most affordable states in the US that guarantees a high standard of living to everyone. This is achieved by comparatively low prices and high income, so every person living here can use the best amenities characteristic of the largest cities but for half of their price. It is natural that homes in Salt Lake City metropolitan area are more expensive than around the state in general, but still, utilities, groceries, rental prices are even lower than around the country. Naturally, the median home price in Utah is higher than around the US: compare $302,000 and $216,200. 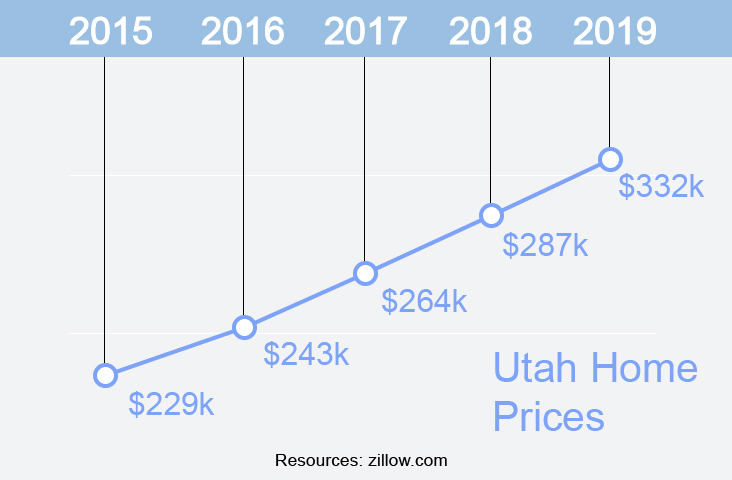 However, a huge role in this price is played by homes located in Salt Lake City (homes are 90% more expensive there than in average around the US). It means, that living in the residential area is very affordable and almost every working family can obtain a home there. 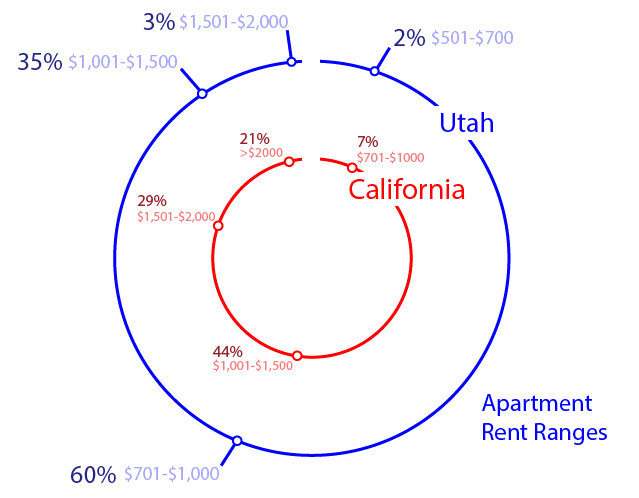 Rental prices are similar to the national average ones. You need about $1,000 to live in the 1-bedroom apartment and double this amount to rent a 4-bedroom flat in the metro area. In other counties, rental prices are twice lower. Utah is a perfect choice in regard to climate, as local residents can feel all the features of the dry continental climate. They enjoy summer warmth and reasonably cold winters. There is rather low precipitation and the temperature rarely goes in its extremes. Any cold winds and waves are blocked by the mountains, so the average yearly temperature is about 52° F.
You can hardly find another state in the US that can boast such a high level of safety as Utah does. The biggest number of crimes takes place in Salt Lake City, and it makes the average crime rate in Utah be a bit higher than the national one. These are mainly property crimes, while violent crimes are 36% lower than on average around the country. However, the biggest part smaller cities and towns in Utah can boast 80% lower crime rate than the average one around the state and it is a decent proof of the high level of safety there. One more fact that speaks louder than words is a strong religious background that minimizes the possibility to become a victim of any crime. In 2016, Utah was ranked the 9th safest state in the US too. Utah can be proud of schools located there, as they attract thousands of students to this state. You can find many decent higher-learning institutions there, but it’s impossible not to mention Salt Lake Community College (the second best community college in the country), Westminster University (22nd place in the national rating), and two more institutions from top 50 of the best national ones – Brigham Young University and University of Utah. Most of the state area is covered with mountains and it opens a diversity of opportunities to enjoy outdoor activities. Unbelievable scenery, beautiful rivers, and lakes with crystal water, fresh air contribute to such great activities as cycling, hiking, climbing, scuba diving, backpacking, horse riding, and even skiing etc. There are 5 National Parks popular with tourists as well as multiple annual festivals that guarantee unforgettable nightlife. Utah can be a perfect place to look for a job or start your own business. There is a very low unemployment rate – about 2.9%. Moreover, there has been a 70% increase in the number of high-technology jobs for a couple of previous years. Salt Lake City is regarded to be one of the best city to start a career and build your own small business. Utah has also had the fastest-growing labor force since 2010 and it is a key element in the overall state economic growth. In 2014, for example, it was the best overall performing state in economic growth and it does not leave its leading positions now too. Utah attracts many people by the possibility to live among the young population. It is the state with the youngest population in the US – the median age is 30.5 years only. Moreover, most of the people living here are educated. Over 90% of students successfully graduate from high school. 30% of graduates enter higher educational institutions to get degrees. Utah is one of few states that can offer its residents an upgraded highway system. The state is interconnected and can be easily traversed. Salt Lake International Airport is the largest Delta Hub in the west, while a constantly growing light rail system can take you in any direction. You will appreciate an award-winning bus system and FrontRunner commuter rail too. People living in Utah have a very high level of well being and it is more than in all the US cities. Salt Lake City has been ranked the second friendly list city in the country, while all people feel equal in this state. No wonder there is the largest LGBT community here too. Moreover, Utahns are the most generous people in the country. Most of them admitted donating money, volunteering, and helping strangers. However, despite such a big number of benefits, there is still a question: should you move to Utah? At least, there are some facts about this state that may discourage your belief in its perfection. According to the recent estimate, about 62% of Utah’s population are Mormons. In two southern counties, their number exceeds 83% of the local population. It means that even local authorities consist partially of Mormons. Utah cannot be called a tax-friendly state. There are several taxes paid by local residents. It is a income tax (4.95%), sales tax (5.95%-8.70%), property tax (0.66%), gas, cigarette, and alcohol taxes. If to compare state income collections in Utah with other states, it is the 25th highest in the country. Despite the relatively affordable cost of housing in Utah, there is bad news for people who are planning the move. Prices are constantly rising – by 7.4% over 2018, and experts predict that they will continue to grow. The western part of Utah is mostly an arid desert, while the south and south-east of the state remind a terrain. Sandstone dominates this area. Southwestern part is the hottest and driest area in Utah. As a result, all the cons of deserts and sandstone such as insects, lack of water and other are characteristic of Utah geography as well. The state roads have a small number of speed bumps. It allows local drivers to feel too self-confident on the road. Moreover, when they turn for drivers license, their DMV test is not strict enough too. Why companies moving to Utah? Nowadays, not only local residents wish to live in Utah. There are many reasons to move to Utah for businesses as well. Most often these are small companies, but some of the world giants such as Facebook and Adobe take advantage of this opportunity too. Let’s find out why companies choose Utah as for running their business. More than 8% of Utah population are employed in technology, and such a great increase by 42% happened between 2016 and 2017. Many specialists have been attracted to this state and it created a tech base for other businesses. Many companies located in Silicon Valley, for example, have to compensate money to their employees for the necessity to live in such an expensive region. In Utah, things are absolutely different. People can not only earn their living getting an average salary but also enjoy their lives. Moreover, utilities (e.g. energy is 29% cheaper) and rent are cheaper in Utah, so companies spend less money on facilities too. Despite the fact that there is a flat tax in the state, it is still lower than all around the US. Being only 5%, taxes paid by companies appear to be not so high as in other states. The success of the company is interrelated with the state economy. In Utah, there was a constant increase by 2% annually for the last 5 years and it is a proof of success. Moreover, the state has a very low unemployment rate and a rather high percentage of college graduates, so this tendency in the economy will continue. It is natural that you can find much useful information about moving to the state, but there is very little data about other decent cities and towns in Utah apart from Salt Lake City. If you are moving to Utah from California or any other state, learn a bit more about the best places to settle in Utah to make your choice reasonable. Many Californians moving to Utah would like to learn the information associated with this state. However, there are several facts that make Utah outstanding among others. Why did Mormons leave New York and moved to Utah? The church of Mormons was created in New York, but after the death of their founder, all Mormons were persecuted because of extermination passed against them. They moved towards Missouri, Ohio, and Illinois, but later they were also asked to leave this territory, so they headed for the west to Utah and settled there. Why not try local specialties like fry sauce or funeral potatoes? Utah has a number of local dishes eaten only there. Of course, it is a famous fry sauce invented by Don Carlos Edwards, as well as funeral potatoes. The latter ones are very tasty and cooked with cheese, sour cream, chicken soup cream, and cornflakes. As Mormons don’t drink coffee, they consume Postum instead. It is a caffeine-free beverage based on wheat grain and molasses. What makes Provo one of the top-rated cities for living? Utah must be proud of such a city as Provo. It is famous for its minority of unemployed people, high quality of living and young population age (median age is only 24). It has been one of the leaders in many ratings including the city for career opportunities as well as city with the biggest number of mansions. Moreover, this city can boast the best well-being in the country, so it can be called a paradise for every person. Are you thinking of moving from California to Utah? Or do you know anyone who is planning to relocate to Utah? In fact, there are several ways to do that depending on the volume of belongings you have and the number of people moving. Naturally, the most comfortable way is to turn to the professional moving company such as California Movers and deliver everything in the perfect state to your new home. We are a full-service company and deal with all the challenges connected with relocation, so our trained and careful movers are worth your trust. However, if you are going to move alone, there are several ways to arrive in Utah from any neighboring state. It goes without saying, the fastest but the most expensive way is a plane. If you own a car or like going by bus, there are excellent highways to take you to the new place of living, while people who prefer railroad can catch a train too.